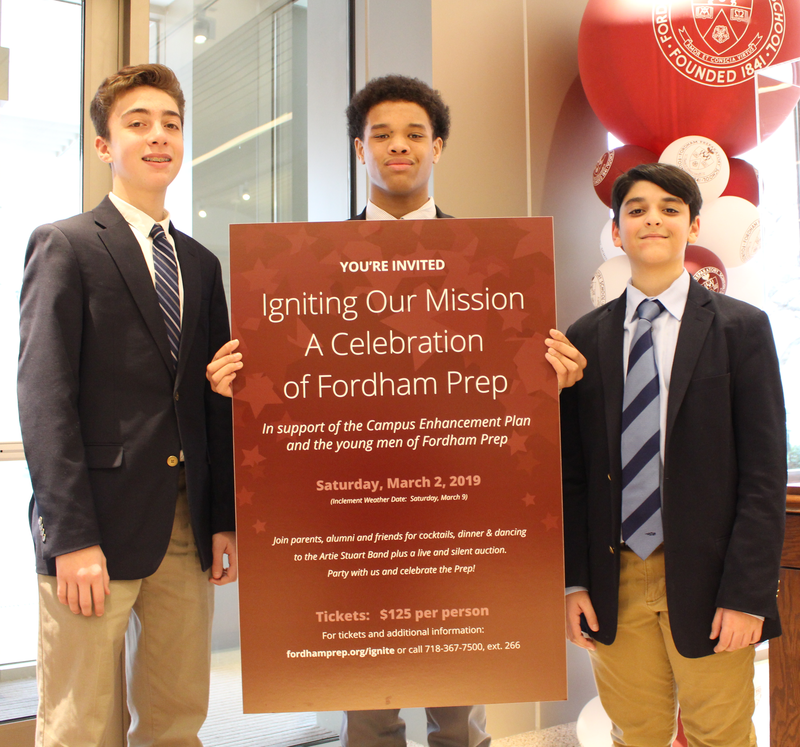 Please join us at the Prep on Saturday, March 2, for the second-annual, Igniting Our Mission - A Celebration of Fordham Prep event. This year's event has a lower ticket price ($125 per person this year versus 2018's $175). An evening of cocktails, dinner and dancing with a live and silent auction, celebrating the groundbreaking of our Campus Enhancement Project, will take place on Saturday, March 2. All proceeds will benefit the creation of 11 new classrooms, a new guidance center and admissions office and a building renovation that will support the Prep's current enrollment of between 950 and 1,000 young men, not the 750 students the building was designed for nearly 50 years ago in 1972. A full open bar all night, not just wine and beer. Bars will be located in the Commons, Hall of Honor and Leonard Theatre. Passed hors d'oeuvres and a strolling dinner with multiple food and carving stations in the Commons, in addition to the dessert tables and coffee stations. Entertainment will be provided by the Artie Stuart Band (password to access clip: LRJAN17), well-known in NYC circles for performing at social and charitable party events. We will have a dance floor and lounge furniture to transform the Commons. Our auctioneer for the evening will be NBC-TV Sportscaster Bruce Beck who will be adding his own one-of-a-kind sports experiences (calling Mets, Yankees and US Open tennis fans!) to the bid offerings which also include vacation homes, Prep parties, and faculty and alumni-hosted day trips for students and parents. To recap, all tickets are priced at $125 per person and include garage parking at the University lot, shuttle service to/from the Prep, an open bar all evening, dinner, dancing and a dessert lounge. The invitation and additional details are below. We hope you will join our growing attendee list and help us make Igniting Our Mission - A Celebration of Fordham Prep the place to be on Saturday, March 2.